The Freedom to Travel to Cuba Act! 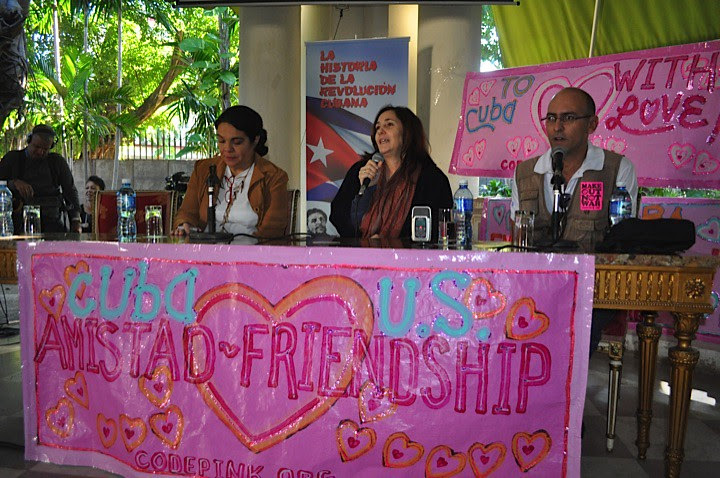 Photo from the last CODEPINK delegation to Cuba! My name is Jamila Brown, and I’m the CODEPINK Cuba campaign coordinator. I’m writing to you today because we’re closer than ever to normalizing relations with Cuba and we need your help. Let’s encourage the Senate to pass The Freedom to Travel to Cuba Act! On Tuesday afternoon, President Obama recommended Cuba’s removal from the State Department’s state-sponsored terror list. For more than 30 years, Cuba was unjustly given a terrorism designation despite posing no threat to U.S. national security. While we celebrate yesterday’s announcement as a victory for diplomacy, the unconscionable Cuban embargo remains in tact. Tell the Senate to keep the momentum going and normalize relations with Cuba! On April 26 we will take our second CODEPINK delegation to Cuba, but we are only permitted to go because it’s an educational trip. Cuban travel is still restricted for U.S. citizens and only Congress holds the power to change it. Senate bill 299, The Freedom to Travel to Cuba Act, would allow any U.S. citizen to travel to Cuba at their own leisure. Wouldn’t you like to lay on a Cuban beach? We would! Act now! Let the Senate know their constituents support Senate bill 299! We won’t stop until U.S.-Cuba relations are fully restored. Join us and demand your right to travel to Cuba.